Dance, like other forms of art, has treated the subject of death continually throughout history and will continue to be used as a vehicle to express human fascination with this eternal unanswered question. Rituals have surrounded the mystery of death from prehistoric times. Repeated rhythmic movements become dance, and the solace of rocking and keening can be therapeutic. Funeral processions are an example of organized movement to music, expressive of grief. The aboriginal peoples of Australia sing and dance to evoke the clan totems of a dying man and two months after death dance again, recreating the symbolic animals to purify the bones and release the soul of the deceased. The Sagari dances are part of a cycle performed on the anniversary of a death on the islands of Melanesia, New Guinea. Dancing by a female shaman is an important element of Korean ceremonies to cleanse a deceased soul to allow it to achieve nirvana , closing the cycle of birth and rebirth. At Kachin, Upper Burma, funeral rites include dances to send back death spirits to the land of the dead. Dayals (shamans) of Pakistan fall into trances to imitate the spirits of the dead. In Africa the Kenga people perform Dodi or Mutu (mourning dances) on burial day. The Yoruba dance wearing a likeness of the deceased, and the Dogon of Mali perform masked dances to confront death and pass on traditions after death. The Lugbara people of Uganda and the Angas of northern Nigeria also include dance in their rituals surrounding death. The Umutima Indians of Upper Paraguay, South America, possess seventeen different death cult dances. Mexico celebrates All Souls' Day with masked street dancers dressed in skeleton costumes. The Ghost Dance of the Plains Indians of North America reaffirms an ancestral tribal continuity and has recently been revived after prohibition by the U.S. government, which deemed the dance subversive. 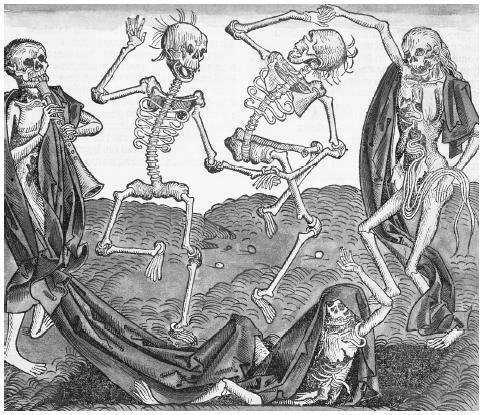 The Danse Macabre (Totentanz, or Dance of Death) of the European Middle Ages was portrayed many times on the walls of cloistered cemeteries as a dance of linked hands between people of all levels of society and the skeletal figure of death. These painted images were executed in a period of anxiety caused by the bubonic plague which swept the continent, killing a large percentage of the population. In the Romantic period of the nineteenth century, a morbid fascination with death and the mysterious produced ballets such as the ballet des nonnes in Giacomo Meyerbeer's opera, Robert le Diable (1830), Giselle (1841), La Peri (1843), and La Bayad Ère (1877), all of which present scenes with ballerinas dressed in white, vaporous costumes representing spirits after death, floating on their toes or suspended by invisible wires and illuminated by moonlight fabricated by the technology of gas lighting. Many of these ballets are still performed, providing the ballerina with the artistic challenge—roles in Giselle or La BayadÈre —of a dramatic death scene followed by the difficult illusion of phantomlike, weightless spirituality. Twentieth-century dance has used death as the inspiration for many dance works; the most perennial is Mikhail Fokine's Le Cygne (1905), commonly known as The Dying Swan. Created for the dancer Anna Pavlova to express the noble death struggle of a legendarily silent bird who only sang at death (thus the idiomatic "swan song"), it remains in the repertory in twenty-first-century performances. The great dancer and choreographer Vaslav Nijinsky set the shocking theme of a virgin dancing herself to death by violent, percussive movements as a sacrifice for a fecund harvest in prehistoric Russia, matching composer Igor Stravinky's iconclastic score for The Rite of Spring (1913). In post–World War I Germany, Mary Wigman, high priestess of ausdruckstanz (the expressionistic modern dance style), used expressionist movement and masked ensembles to great effect in Totenmal (1930), showing the devasting impact of death on society. Another choreographic masterpiece from Germany is Kurt Jooss's The Green Table (1932), inspired by the medieval Danse Macabre paintings. This work shows Death himself taking, in different ways, the people caught up in a war; in essence, only Death is the victor. The choreographer Martha Graham created Lamentation in 1930, which is portrayed through minimal rocking movement, the anguish and despair of mourning. In this dance she retained a passive face, only rising once from a sitting position, her movements stretching the fabric of a jersey tube, yet producing a profound image of distraught motherhood. The Mexican choreographer Guillermina Bravo treated the subject of death in several modern dance works, influenced by Mexico's folk traditions. In La Valse (1951), George Balanchine, choreographer and director of the New York City Ballet, created an ominous image of death in the guise of a man dressed in black, offering a black dress and gloves to a young girl at a ball, thereby claiming a victim. In Canada, choreographer James Kudelka exorcised the pain of his mother's death from cancer in his ballet In Paradism (1983). This piece shows the stresses placed on a dying person by family and friends, and the encounter with a guide (nurse, priest, angel) who leads the protagonist from denial to acceptance. In this work the dancers all wear skirts and roles are interchangeable, eliminating references to gender. Kudelka composed two other works, Passage (1981) and There Below (1989), giving his vision of an afterlife. The choreographer Edouard Lock projected prolongated films of the dancer Louise Lecavalier as an old woman on her deathbed in his piece 2 (1995), showing her life cycle from childhood to death. Since the 1980s many choreographers have responded to the AIDS (acquired immunodeficiency syndrome) epidemic by making deeply felt statements through dance. After the death of his partner, Arnie Zane, choreographer Bill T. Jones used performers with terminal diseases who recounted their experiences confronting death in Still Here (1994). Maurice Bejart, choreographer and director of the Ballet du XXieme Siecle, after showing Ce que la mort me dit (1980), a serene vision of death, presented an evening-long piece, Ballet For Life (1996), in memory of the dancer Jorge Donn and the singer Freddie Mercury, both deceased from AIDS-related illnesses. The list of dance works treating the subject of death is very long, and the symbolic figure of death appears in many choreographic works. Titles like Andrée Howard's Death and the Maiden (1937); Frederick Ashton's dances in Benjamin Britten's opera, Death in Venice (1974); Erick Hawkins's Death is the Hunter (1975); Flemming Flindt's Triumph of Death (1971); and Death by the Indian choreographer Astad Deboo are numerous and underline the continuing fascination of dance creators for the subject. Carmichael, Elizabeth. The Skeleton at the Feast: The Day of the Dead in Mexico. London: British Museum Press, 1991. This woodcut print of A Dance of Death from Liber Chronicarum shows the "band" of four skeletons following their leader, Death; thus began the personification of death. Hodson, Millicent. Nijinsky's Crime Against Grace: Reconstruction Score of the Original Choreography for Le Sacre du Printemps. Stuyvesant, NY: Pendragon Press, 1996. Huet, Michel, and Claude Savary. Dances of Africa. New York: Harry Abrams, 1995. Lonsdale, Steven. Animals and the Origins of Dance. New York: Thames and Hudson, 1982. Morgan, Barbara. Martha Graham: Sixteen Dances in Photographs. Dobbs Ferry, NY: Morgan and Morgan, 1980. Vaucher, Andrea R. Muses from Chaos and Ash: AIDS, Artists and Art. New York: Grove Press, 1993.